It’s a small world after all — smaller in house size that is! A number of southern Albertans are downsizing as retirement is in the cards or singles are looking for an affordable and/or more environmentally-friendly investment. Smaller homes or “tiny homes” are becoming a popular way to build, as costs keep going up and home owners continue to be more conscious of their environmental footprint on Planet Earth. 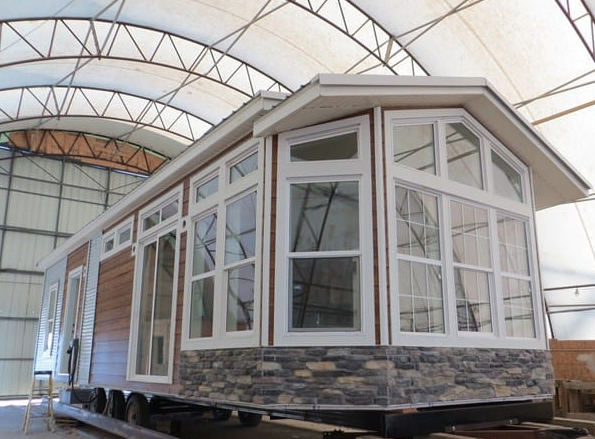 Mountain View Industries, located in Cardston, services Western Canada with energy efficient, “ready to move,” and modular homes — from custom-built homes, cabins and multi-family structures to “tiny homes” and park models. “We have been producing our housing for dealers, developers, municipalities, and communities who want to work towards sustainable, energy-efficient homes for future generations to come,” the southern Alberta business stated on their official website. “We are collectively implementing new standards and creating new benchmarks that will one day reshape our communities to be greener with less impact to the environment,” it was also stated. According to Mountain View Industries, the locally-operated business has a home for every price range starting at $65,000. Mountain View Industries also has southern Alberta’s largest indoor facility. “You will get uninterrupted production with no damages caused by weather or unsupervised trades,” it was noted on MVI’s website. “When you’re framing, you don’t have to worry about rain or snow or ice,” said Ron Spasoff, an associate of the business — who works with Mountain View Industries, as the Cardston-based business builds park models for Spasoff at their unique indoor facility. Smaller homes are becoming more and more attractive and affordable for new home owners or those wanting to go small. But when it comes to “tiny homes” there’s a misconception and Spasoff doesn’t like the term very much. “On that term ‘tiny houses’ — I’m not a big fan of it because I know what people see on TV are these home build things on trailers. Really, to me, they’re not functional. They look good, you need somewhere to park them — but if you’re looking for something under 300-square-feet the RV industry has kind of mastered that,” he noted. For a truly functional home a senior or a single person could live in, Spasoff added, a 500-square-foot park model with custom plans could be a good starting point. He also noted some communities don’t like the idea of small under 300-square-feet homes in neighbourhoods and some communities will even nix development plans for those types of projects. “There is a ‘sweet spot.’ The 500 to 800-square-feet — where you can be functional, look good, and look like a small house and still have all the characteristics of a small home — but look like an estate level-type stuff. That’s one of the things — they can be small, they don’t have to be boring,” he said. In southern Alberta, Spasoff said the industry is going to go nowhere but up. According to Spasoff, he will look at a home site, view lines where a home could use a nice large window, and he could absolutely build a custom home. “I’ve done over 50 custom homes under 1,000 square-feet,” he added. These types of homes are more permanent and not easily moveable, he said. “You can move them, but it takes a semi. It’s not like an RV — you’re going to hook it up to your half-ton and move it. These are actually usually either blocked and levelled or on piles or sometimes on crawl spaces,” Spasoff explained. One thing Spasoff wants possible customers to know is with park models it is not only about price — it can also come down to if the park model size chosen will be allowed at the selected resort. Even though smaller homes are more affordable than traditional homes, the idea the cost of a “tiny home” could be $30,000 is a misconception.